At finde værdifulde aktiviteter for børn under rejsen kan være en udfordring, men dette parfume værksted gør det lidt lettere. En duftekspert hjælper dig og dine børn bliver spirende alkymister ved at skabe dine egne parfume i en femte generation arv parisisk parfume. Derefter kan du handle for dufte til rabat. This was such a special treat for my kids. The staff were so pleasant and informative about how to make perfume. My children were delighted with the perfume that they created. They loved decorating the perfume bottles. Overall, it was a nice activity in a lovely atmosphere. My ten year old granddaughter thoroughly enjoyed learning about how perfume is created and then finding the right essences to combine to make her scent (as did I). 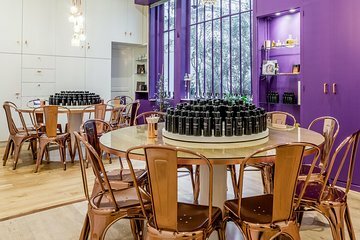 We enjoyed the experience in the shop rather than the larger room and loved the intimacy of the experience and the ability to share it together. The staff was very engaging, helpful and encouraging. We then continued the experience each evening by applying our perfumes before going out to dinner.